As you might expect, there are over a thousand places to stay in Bangkok, including hotels, inns, B&Bs and hostels that cater to all budgets and lifestyles. If you’re a backpacker on a budget, Bangkok has very cheap places to stay, but equally anyone looking for a luxurious hotel with all the bells and whistles won’t be disappointed either. 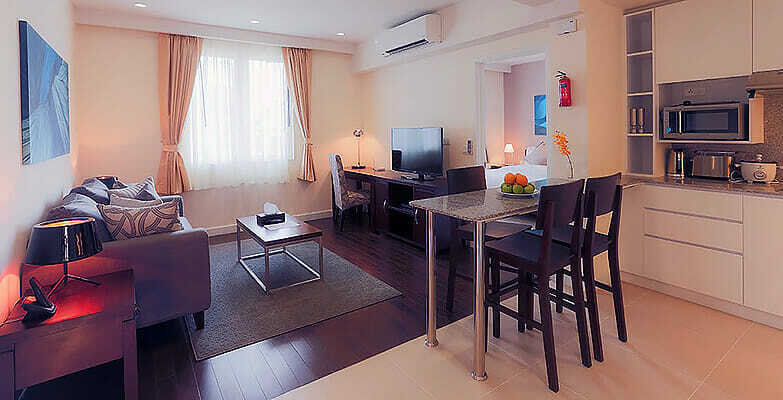 What you may not have considered are Bangkok vacation rentals, and with over 600 of these scattered across the city, this alternate form of tourist accommodation should definitely be considered for your next trip to Thailand’s capital city. Bangkok Vacation Rentals – What’s Available? With over 600 places listed for short term rental in Bangkok you should have no problem finding a place that’s suitable for your needs, and in a location you love. Central Bangkok is a popular spot for renting holiday apartments, and many of the 600 or so vacation rentals in the city are located centrally. Here you’ll find all sorts of places available, from compact studios and suites, to 1, 2 and 3 bedroom condos, some with swimming pools, balconies and super cool roof terraces. Apartments are the most abundant in the short term rental Bangkok marketplace, though if you’re looking for more space and the feeling of privacy there are also full houses available for rent too. Family homes are more likely to be a little further outside of the city centre, but the advantage of this is that they should be quieter and more family friendly if you’re travelling with children. With so many hotels and other options to choose from, you may be wandering what is the point in considering a vacation rental for your next stay in Bangkok. Hotels can be great for one or two nights and do have their own advantages, such as many facilities and restaurants to choose from. A hotel would usually be fully serviced so you don’t have to worry about anything while staying there. You can get help from the concierge, buy a drink at the bar, workout in the gym or spend time in the pool, and, by their very nature hotels are usually centrally located so as to attract guests who want to experience the best of Bangkok. But, hotels – especially the luxurious ones – usually cost far more than Bangkok vacation rentals do. If you wanted to stay for more than just a couple of nights, the cost of a hotel room can become restrictive, forcing you to compromise on a hotel that isn’t as luxurious as you wanted. Here’s where short term rentals in Bangkok win out. The cost obviously does depend on the size of place you’re renting, and on its location and amenities, but, generally speaking you’re going to find that for the space you get, vacation rentals in Bangkok cost less per night than a hotel. And, you can just stay for 1 or 2 nights in a vacation rental; you’re not usually restricted to staying for a whole week, if you don’t want to, though compare the cost of a week in a vacation rental in Bangkok to a week in a hotel, and again you’re going to be saving money. Then there’s the space advantage. A large and luxurious hotel may be spacious in its restaurants and common areas, but you could still be cramped into a small room where you have only minimal personal facilities including a bed, bathroom, TV, possibly a balcony, and possibly a few other facilities too. In a vacation rental you get much more for your money. At the lower end of the scale you can rent a studio or small suite if you don’t need much space, but when you start to look at 1, 2 and even 3 bedroom condos and houses you’re getting so much more space. If you’re travelling with family or a group of friends this is when the cost and space advantages of vacation rentals really beat hotels. In a hotel you may have to pay for multiple guest rooms per night to accommodate your whole family. This means an already expensive nightly rate is doubled because a hotel is unlikely to give you a discount for booking two rooms. In short term rentals in Bangkok you pay a fixed nightly or weekly rate and you choose the correct size apartment for your needs. That price is then split between your whole family or among friends, and so the price per person can be dramatically less than a hotel. For many people who prefer vacation rentals over a hotel it’s the space and privacy that they like best. This is definitely true when you’re renting a whole house, especially if you’re lucky to find one with a private swimming pool. You’ll get the best of both worlds with a Bangkok vacation rental like this because you’ll be close to the city when you want to go sightseeing or shopping, but on other days you can just relax around the pool and enjoy your vacation time. So next time you’re booking a trip to Thailand’s capital be sure to check out the great variety of short term rentals in Bangkok. We think you’ll be surprised by what these vacation rentals can offer in terms of space, price, location and privacy. I'm ready show me where I can rent short term in Bangkok!